December 19, 2016 – This week, our time machine swerves Into the Past Lane. Our guest is, Edward T. O’Donnell, host of the Into the Past Lane podcast and author of Henry George and the Crisis of Inequality: Progress and Poverty in the Gilded Age . 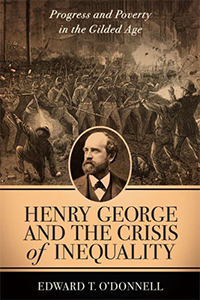 You may not know who Henry George is, but his ideas swirled around the campaign for president throughout the recent election, and his approach to solving political and economic problems are timeless. Ed earned his Ph.D. in American History from Columbia University, and is an Associate Professor of History at Holy Cross College in Worcester, MA. You can follow him on Twitter @InThePastLane, give his show a listen at InThePastLane.com/Podcast, and find him online at EdwardTODonnell.com.